It is possible to homeschool preschool with picture books. We read a lot when my children were young. There are books that will introduce your child to the alphabet, numbers, shapes, and preschool concepts. You can develop a theme by adding crafts and other hands-on activities to the stories your read to your child. Learning to read involves understanding the letter symbols and the sounds that the letters make. Most alphabet books teach both concepts. You will want to point to the letter on the page and say the sound of the letter. Also point to some of the words and stress the letter sound. Here are five alphabet books that will help you homeschool preschool with picture books. With two of the books I have written activities that you can do. Read the books over and over your child will love to hear the familiar stories. The story is about letters climbing up a coconut tree in alphabetical order. Too many letters are in the tree so some the letters fall to the ground and get hurt. The book is written in rhyme. After reading the book, have your child repeat the phase Chicka Chicka boom boom! Will there be enough room? Here come --- up the coconut tree. Have your child add a letter to the blank. ABC Animal Jamboree ---- by Giles Andreae and David Wojtowycz is another rhyming book. Your child will not only learn the upper and lower case letters of the alphabet but something about fruits and vegetables of the world. There is a glossary in the back of the book. Use one or two fruits or vegetables on the page to serve at lunch. Say something like today is "a" day we are having apricots and asparagus for lunch. In the book two children go to the farm to visit their grandparents. The book is written in fun rhyme. In the book each animal has a collective noun associated with it. You can use this book to teach about letters and numbers. Here are some other fun alphabet activities that you can do with your young child. Some counting books start with one. Others count down, starting with ten. Here are five counting books. Have your child count the items mentioned in the story. The book is about ten hamsters that arrive at the door. The hamsters help the boy get ready for bed. The book counts down from 10 to 1. Doreen Cronin the same author that wrote Click, Clack, Moo. In Click, Clack, Splish, Splash the adventure is about Duck who goes on a fishing trip. The book counts up from one to ten. For an activity give your child 10 cardboard fish shapes and a plastic bucket. Have your child toss the fish into the bucket while counting to ten. You can use this book to teach about the numbers one to twelve. For a hands-on activity make a salad out of the ingredients mentioned. The story is about a young girl takes a walk through the country where animals play. She counts the animals. The book is written in rhyme. The story is about six wombats on an adventure in the Australian outback. Your child will also learn about Austrian terms and wildlife. There are books that will teach your child about shapes and the days of the weeks. Shape by Shape ---- by Suse MacDonald is about geometric shapes. Use the book to teach your preschooler about different colors and the days of the week. Here are some other math activities that you can do along with your picture books. 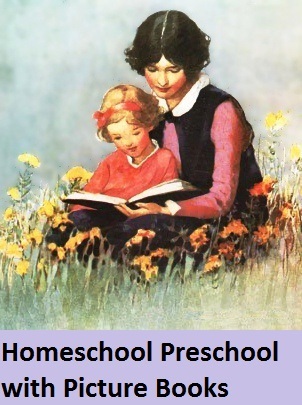 You can homeschool preschool with picture books if you have a theme. From apples to zoo animals there are picture books that have been written. Here is an example of how to use picture books to teach your preschool child about the zoo. Go to the library so that you can homeschool preschool with picture books. Your children will love having your read the books over and over.